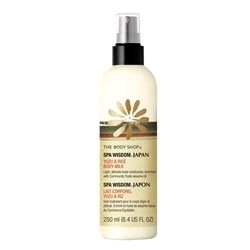 This lightweight spray-on body moisturiser is inspired by Japanese bathing rituals. It has a fresh citrus scent. Spray onto skin and massage in. Aqua (Solvent/Diluent), Ethylhexyl Palmitate (Skin Conditioning Agent), Glycerin (Humectant), Cyclomethicone (Emollient), Orbignya Oleifera Seed Oil (Emollient), Glyceryl Stearate (Emulsifier), PEG-100 Stearate (Surfactant), Sesamum Indicum Seed Oil (Skin-Conditioning Agent), Parfum (Fragrance), Dimethicone (Skin Conditioning Agent), PEG-40 Stearate (Emulsifier), Phenethyl Alcohol (Fragrance Ingredient), Caprylyl Glycol (Skin Conditioning Agent), Camellia Sinensis Seed Oil (Skin-Conditioning Agent), Propylene Glycol (Humectant), Cetearyl Alcohol (Emulsifier), Butylene Glycol (Humectant), Linalool (Fragrance Ingredient), Acrylates/C10-30 Alkyl Acrylate Crosspolymer (Stabiliser/Viscosity Modifier), Xanthan Gum (Viscosity Modifier), Disodium EDTA (Chelating Agent), Sodium Carbomer (Emulsion Stabiliser), Sodium Hydroxide (pH Adjuster), Citronellol (Fragrance Ingredient), Oryza Sativa Extract (Hair Conditioning Agent), Sorbitol (Humectant), Citral (Fragrance Ingredient), Citrus Junos Peel Extract (Skin Condtioning Agent), Tocopherol (Antioxidant). This body milk is beautiful and excellent in hydration properties. The bottle is an easy hold slim shape with a fine spray mist applicator that allows even application and prevents over use of the product. The milk has an off white/ cream colour with a very light consistency which makes it easy to mist onto the desired areas of the body. There is a delicate citrus and floral scent that does lightly fragrance the skin but is not overpowering and does not clash with your fragrance. I mist my body with the milk and then rub into the skin and it absorbs beautifully and quickly without leaving a greasy residue. It doe leave a beautiful sheen on the skin. After application your skin feels soft, supple and hydrated and the effect lasts all day. It is worth bearing in mind that this is not designed as a deep penetrating moisturiser but a light hydrating treatment of which it does a beautiful job. The product contains sesame oil and babassu oil which perfectly nourish the skin and locks in the moisture. "This body milk is beautiful and excellent in hydration properties. The bottle is an easy hold slim shape with a fine spray mist applicator that..."